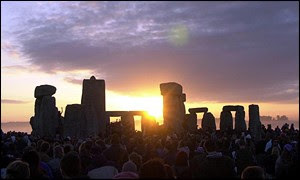 Editor's note: Those who witness the sun rise on the longest day, at Stonehenge, often experience an overwhelming sense of being connected to nature by ancient rite. Each year, it seems, more non-pagans are taking an interest in pagan beliefs. That's evocative. I like it very much.